Mantinia is an electronic font. Never existed in metal. 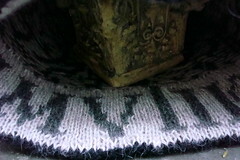 Existed in stone and paint, but never in metal (unless retrospectively). It was, in short, born digital. Typographer Matthew Carter designed Mantinia as a tribute to the Paduan painter and printmaker, Andrea Mantegna (1430/31-1506). Mantega for his part was a passionate antiquarian, which in the fifteenth century meant that he was fascinated with imperial Roman architecture, history, and . . . inscriptions. Mantegna was from Padua, where he was privileged to study at the city’s renowned university (founded 1222), but he spent most of his career in Mantua. His panels, murals and prints all display his interest in classical themes, architectural styles and motifs. He is probably best remembered for his painting of the dead Christ, seen in forced perspective from foot level. 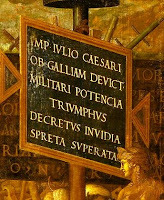 A great example of his painted inscriptions can be found in his series, Triumphs of Caesar, which Charles I acquired for the British royal collection. The series now lives at Hampton Court Palace. (At right: Mantegna exhibition poster, 2006-2007). This (at left) is the second segment of Triumphs of Caesar (1484-92) and the detail depicts standard bearers in a triumph, or military procession (complete with vanquished foes and booty), honoring Julius Caesar’s conquest of Gaul. As a humanist, Mantegna took great interest in classical forms, and his focus on Roman letterforms displays a fine taste for the most refined Roman inscriptions. As a proper Renaissance artist, he was very much concerned with the task of resurrecting interest in Classical forms (including letterforms) from architectural sources, rather than from Gothic textual scripts that were more prevalent in manuscripts of the fifteenth century. He was particularly interested in the initial letters, opening verse or inscriptions with a bold design statement and setting the tone for the text to follow. On the five-hundredth anniversary of Mantegna’s death in 2006, Mantegna’s three cities (Padua, Verona, Mantua) each hosted exhibitions of the artist’s work. Fittingly, the advertisement text was set in Matthew Carter’s Mantinia. 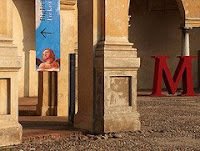 A large, three-dimension letter “M” (set in Mantinia, naturalmente) was erected outside each venue (and stood about six feet high and pictured at right in Damiano Daresta’s exquisite photo). Also stenciled on the streets of Mantua as breadcrumbs, leading visitors to the three exhibition sites, were red Mantinia Ms.
Do not reproduce without first obtaining permission from the photographer. Matthew Carter designed Mantinia in 1993 as a titling font, which means that it was meant to function like, well, an Imperial Roman inscription: bold statements, full of weight and power. Mantinia is an all-capital font. Carter is quite the erudite typographer, and the pamphlet he designed to accompany and demonstrate the intricate possibilities of the Mantinia font is rife with his own scholarship on Mantegna’s antiquarianisms. He also designed the lovely font, Galliard (for which he is probably best known). Its italic and Mantinia complement one another beautifully. He designed a number of alternate characters, raised capitals, tall capitals, ligatures, and even ornaments for Mantinia that give the type designer a whole range of juicy possibilities. Some of his other type designs include: Snell Roundhand, Georgia (which you are reading now, unless your browser has made a substitution), and Sofia. 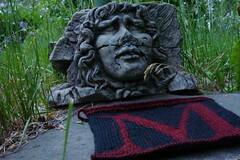 I’ve created my own red Mantinia M, this one in yarn. 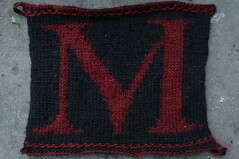 For now, it’s another letter in my knitted abecedarium, but I’m saving it as an idea for a bold statement later on. I have, however, used Mantinia letters in another project. I charted a few words to create, well, let’s call it a name tag, on the inside rim of a hat. The original pattern comes from Adrian Bizilia of Hello Yarn. I used her brilliant pattern, “We Call Them Pirates,” but substituted ampersands for skull & crossbones. The pattern is incredibly well conceived and an absolute joy to knit. I’ve now made it three times (but only once with ampersands). Adrian has designed a matching mitten set as well. As of this writing, Ravelry members have made the hat pattern 761 times, which is a measure of how wonderful a pattern it is! Download it for free from the Hello Yarn site. Here is my chart for the ampersand variation of Adrian’s “Pirates” design. Margaret Re, ed. Typographically Speaking: The Art of Matthew Carter. New York: Princeton Architectural Press, 2003. Alec Wilkinson, “Man of Letters; Onward and Upward with the Arts” The New Yorker. Vol. 81, No. 39 (Dec 5, 2005): 56. You are rocking! I really liked your ampersand interpretation of "We call them pirates". That pattern, by the way, has been on my queue for quite some time and needs to get on the needles for my husband this fall. He will get skull and crossbones, but maybe he'll get his name in Mantinia inside the brim. I have been really enjoying this series, and seeing your lovely stranded colorwork. The intersection of history, typography, and knitting is really intriguing and makes for unique reading. Thank you so much, twinsetellen & saralyn! "We call them pirates" is an amazing pattern & very "transportable." I'll try to post my charted adaptation soon. And I'm glad I'm not the only one in the world who likes knitting + history + typography + design. Fabulous blog! I am going to have to work my way back through the alphabet. I love the historic aspect of the details of life and your work is so well written. Gorgeous knitting too. I'm quite sure I'm going to find some inspiration here! You've been tagged. Hope you will play the game (see rules my blogspot). I do want everyone to see what you are up to! Hi - just found you via Teabird. Fabulous blog and I really love your typographical approach to knitting. 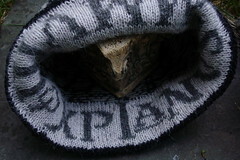 There's a new site devoted to Ampersands, here: http://ampersand.gosedesign.net/ - why not send them a pic of your hat? 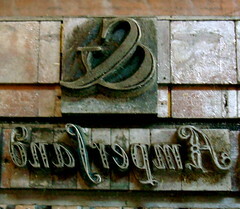 (I'm a bit of an ampersand freak myself - http://julietdoyle.blogspot.com/search/label/Ampersands and would love to feature this in my next round-up. Would you be OK with that? Thanks so much, Julia, and sure--anything for ampersands! We even had them on our wedding cake, so I L*O*V*E the ampersand site and am so happy to know about it and yours. I've just discovered you via Juliet's blog. 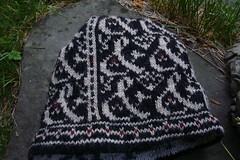 I've seen the hat pattern on Ravelry - but love your interpretation so much more! My knitting is currently scarves and prem wear so I'm not that adventurous yet. Will now work my way back through the alphabet - great blog! (p.s. I'm ClaireA on Ravelry. Like Juliet, I'm also in the UK and also found you through Teabird . . .
What a fabulous, fascinating blog. Will be back - regularly from now on! Thank you all so much for your comments. I'm quite the anglophile, so I'm really pleased to know about like-minded folks across the pond. I don't have any digital pictures of the wedding cake, but will work on digitizing one or two; I guess this blog is going to have to become "Knitting Letters A to &" so that I can do an "ampersand special." For now, I'll just link to some letterpress from the press my husband & I have (the Ampers& Press, naturally). I now know I love Mantinia. The (almost) early modern scholar in me is very excited about the intersection of contemporary technology and good old humanism it represents. And your knitted interpretation is gorgeous! Well! I just LOVE the ampersand hat. I've really been enjoying your blog and all the information you present. Very nice. What a fabulous website! I've just discovered you and have spent the last hour and more marvelling at everything you have done and taking in many of the references - it's all quite, quite fascinating. Thank you so much! I'm hoping to add a new post soon, but N is taking slightly longer than I expected--too many references leading me down various garden paths. I hope everyone will stop back in a few days. I have some new blogs to check out! Hahaha, this is simply excellent stuff you're making! As a typo/graphic designer making some research for Mantegna/Mantinia I was quite surprised. I shall dig deeper in this hitherto me unknown world of typeknitting to make some kind of blog report later. On a smaller note, Galliard is not an exclusivley italic font. It does contain italics though. As a newcomer to Knitting Letters: A to Z, I am limiting myself to one letter per day to delay the gratification of discovery. You had me from "artichoke." You make knitting, history and typography into perfectly natural partners. I am also enjoying exploring the featured blogs. Thank your for your inspired scholarship and creativity.